Mr Dan Mashitisho is currently the Director-General of the Department of Cooperative Governance (DCoG) in the Republic of South Africa. He was the Director-General of the Department of Water and Sanitation where he was ex officio, Sherpa to the State President on matters relating to the United Nation’s High Level Panel on Water (HLPW). 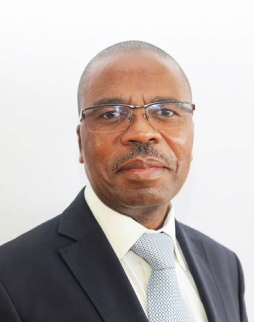 Mr Dan Gorbachev Mashitisho has extensive experience spanning over 22 years, particularly in the field of Local Government and Public Service in general. He served the Gauteng Government for a period of ten years in various capacities as a Member of Strategic Management Team (SMT), Director, Chief Director, Acting HOD of the Gauteng Department of Development Planning and Local Government as well as Board member of the Gauteng City Region Observatory (GCRO) and the Board of Trustees for the Cradle of Human Kind World Heritage Site. He also served in the Council of the University of the Witwatersrand, Johannesburg, as a Ministerial appointee. As a senior manager in Gauteng Government, he participated in the formative processes that culminated in the development of relevant legislation, inter alia, Municipal Structures, Systems as well as Financial Management and Demarcation Acts. Mr Mashitisho served as a Municipal Manager for a period of 12 years, ten years in Mogale City LM and two years in Merafong City LM. It was during his tenure as the Municipal Manager that he founded and was elected Chairperson of the Institute of South African Municipal Accounting Officers (ISAMAO) with the pivotal objective of professionalising the designation of a Municipal Accounting Officer (Municipal Manager). In his early corporate career, Mr Mashitisho joined Transnet Group in 1991 in a middle management position. He was seconded to the Gauteng Government, as a member of the Strategic Management Team responsible for establishing the new Gauteng Provincial Administration to replace the Transvaal Provincial Administration (TPA). Mr. Dan Gorbachev Mashitisho, who is an impeccable Leader, Manager and Turn-around Strategist, holds a Bachelor’s degree and Post graduate qualifications in various academic fields including Law, Management, Politics, Business Administration and Industrial Psychology from the Universities of Witwatersrand( Wits), Johannesburg (UJ) and Management College of Southern Africa (MANCOSA ).